So where did this terrible system start? 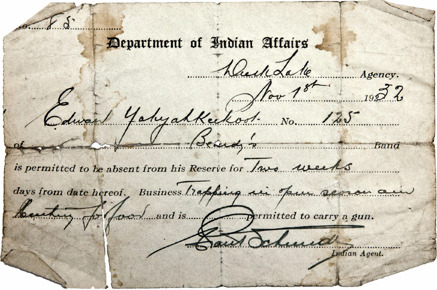 No rebel Indians should be allowed off the Reserves without a pass signed by an J.D. official. The dangers of complications with white men will thus be lessened, and by preserving a knowledge of individual movements any inclination to petty depredations may be checked, by the facility of apprehending those who commit such offences. The implementation of the pass system soon followed. Less than a hundred years ago, individuals were told to essentially “check in and out” with an agent. We ask our readers to imagine having to ask to leave their homes to go buy food from the supermarket - something that Indigenous persons living on-reserve were expected to do (see photo above). The pass system is another example of how Canada has, and continues to, restrict the rights of Indigenous people. Laurie F. Barron, “The Indian Pass System in the Canadian West, 1882-1935” (1988) 13:1 Prairie Forum at 25. Circles for Reconciliation, “The Pass System: Segregation in Canada”, (12 October 2016), online: http://circlesforreconciliation.ca/2016/10/12/the-pass-system-gathering-theme/.